I think I may have to do something else tonight or I will just cry. I am making yo yo's until I feel like I go to bed dreaming about making yo yos. And lord have mercy, what would I have done with out my Clover yo-yo makers. Oh no! Clover have put out an oval yo yo maker! Bugger. I have all the rest and now I have to get this one. Sigh ... yo-yos yo-yos bloody yo-yos. 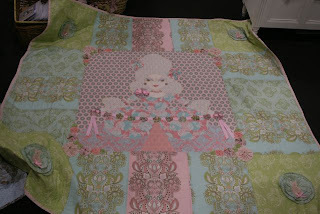 This is the quilt that I am entering in the Katoomba Quilt Show . But I bet you can see the issues with this quilt in this little picture. They just jump out and scream and holler at me. So, I came up with a solution that involves ... you guessed it ... yo-yos. So, I am making yo-yos until they come out of my eyes in every shape colour and size. The quilt (I refer to her as "her, how deranged is that?) needs to be ready for the 6th of March. So its all hands on deck here to get her all spick and span for showing. I'll snap a quick pic of the growing mound of ye olde suffolk puffs tomorrow and put it up here. What a long week. Little pickles started school. No one told me how that would feel ... for a mum. My baby is on her way, I only hope I can keep up.